Davis, D.s.. "Tenskwatawa (The Prophet)". The Canadian Encyclopedia, 21 March 2018, Historica Canada. https://www.thecanadianencyclopedia.ca/en/article/tenskwatawa-the-prophet. Accessed 19 April 2019. Tenskwatawa (the Prophet), Shawnee religious figure (born Lalawethika in Shawnee territory near the Great Lakes, 1775; died in Prophetstown, near Kansas City, Missouri, 1836). Painting by Charles Bird King (circa 1820). Tenskwatawa was the son of Puckeshinwa, a Shawnee war chieftain, and Methoataske, a Creek woman, and the younger brother of Shawnee war chief Tecumseh. The two brothers would fight together in the War of 1812. Tenskwatawa was originally named Lalawethika (Noisemaker), and was born shortly after the death of his father. Puckeshinwa had chosen to support the British with the outbreak of the American Revolution, and was killed at the Battle of Point Pleasant (10 October 1774). Methoataske returned to the Creek in Spanish Louisiana in 1779, leaving Lalawethika and Tecumseh in the care of their sister, Tecumapease, and brother, Chiksika. He showed little promise as a warrior. As a youth he lost his right eye while hunting, purportedly while attempting to nock an arrow. Later he became a "trading post Indian," a contemporary euphemism for drunkard. In April of 1805, Lalawethika experienced a series of visions that he claimed came from the "Master of Life" (the Great Spirit). His detractors alleged that his visions were no more than the effects of detoxification. (See also Indigenous People: Religion and Spirituality). Lalawethika took the name Tenskwatawa (the Open Door). He began to spread the message he found in his visions, preaching that the First Nations must reject the things that came with the White Man, most notably alcohol and Christianity. He also declared that only by abandoning their traditional rivalries and uniting could the First Nations resist the White Man's incursions into their lands. Tenskwatawa had essentially resurrected the message of Neolin, the Lenape (Delaware) religious leader, known to the British as the "Delaware Prophet." It was Neolin who had inspired Pontiac's actions in 1763. Tenskwatawa's vision helped provide Tecumseh with the ideological base for the creation of the Shawnee Confederacy. In 1808, Tenskwatawa and Tecumseh established the large settlement of Tippecanoe at the confluence of the Wabash and Tippecanoe Rivers. The settlement, which the Americans called Prophetstown, attracted warriors from many First Nations. On 7 Nov 1811, American troops under the command of William Henry Harrison attacked Prophetstown. At the time, Tecumseh and most of the warriors were far to the south, as Tecumseh was attempting to persuade more First Nations to join the Confederacy. The Americans had little trouble defeating the few warriors still at the settlement. They razed Prophetstown to the ground. Tenskwatawa and the survivors fled north to Upper Canada. The Battle of Tippecanoe, during the War of 1812, ended any hopes of attracting more First Nations to the Confederacy. 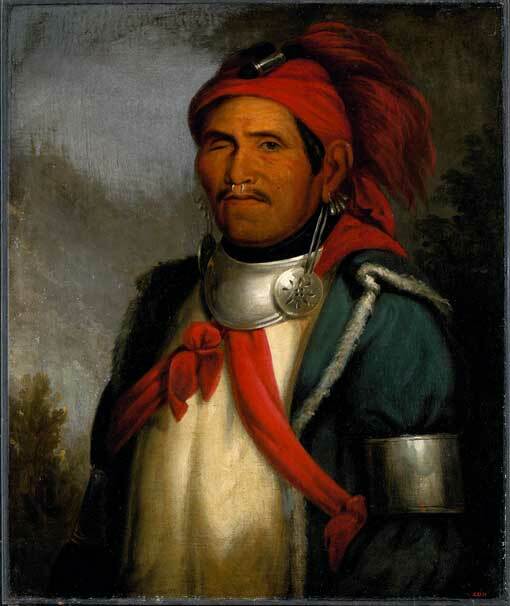 Tenskwatawa accompanied Tecumseh, and was present at the American surrender of Detroit. The following year, Tecumseh was killed at the Battle of the Thames (also known as the Battle of Moraviantown). Tenskwatawa survived, as he retreated with the British forces under the command of Major General Procter. 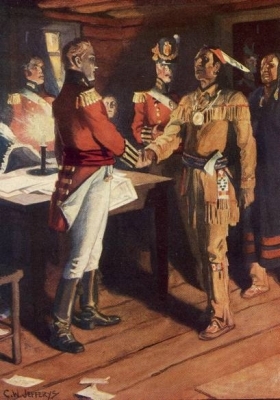 With the end of the war (Treaty of Ghent, 24 Dec 1814), Tenskwatawa remained in Canada. 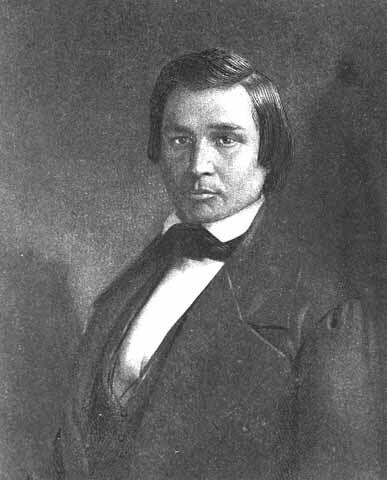 He returned to the Shawnee lands in 1825, and aided in the relocation of the Shawnee people west of the Mississippi River. Tenskwatawa established a new Prophetstown near present-day Kansas City, where he died in 1836.